HONG KONG, May 10, 2017 - (ACN Newswire) - Telecom Digital Holdings Ltd ("Telecom Digital" or the "Company"; SEHK: 6033) announced that its shares commenced trading today on the Main Board of the Hong Kong Stock Exchange under the new stock code 6033. The Company's shares were previously listed and last traded on GEM (stock code: 8336) yesterday (9 May 2017). Telecom Digital and its subsidiaries (the "Group") is one of the leading comprehensive telecommunications service provider in Hong Kong. The Group mainly operates telecommunications and related business, including retail sales of mobile phones of various brands and pre-paid SIM cards, distribution of mobile phones and related business, provision of paging and other telecommunications services and provision of operation services to SUN Mobile. The Group has been actively expanding its retail and operation business. As at end of April 2017, it runs a total of 69 shops. Building on its extensive shop network, the Group affords a wide exposure to potential customers and is also able to effectively promote its services and provide convenient, efficient and quality services to customers. The Company recorded a 3.4% increase in profit attributable to the owners to HK$89.7 million for the year ended 31 March 2016 as compared with the previous year. For the nine months ended 31 December 2016 compared with the corresponding previous period, the Group's profit attributable to the owners climbed 15.5% to HK$72.4 million, reflecting mainly the increase in operating service income. The Company has declared a total dividend of HK0.1 cent for the financial year 2015/16, representing a dividend payout ratio of 45.45%. 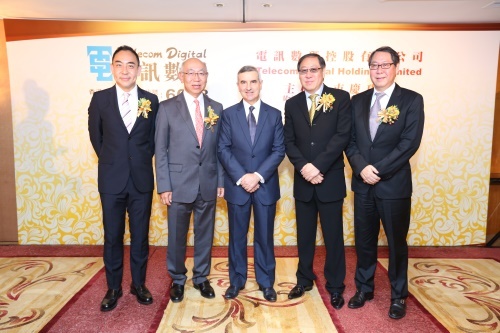 Mr. Cheung King Shek Alex, Chairman and Executive Director of Telecom Digital Holdings Limited, said, "The listing of Telecom Digital on the Main Board of SEHK today marks another important milestone in the company's development. We believe transferring to the Main Board will enhance the Group's profile, strengthen public and investor recognition of our business as well as improve the trading liquidity of our shares, and give us financing flexibility, all of which will benefit future growth of the Group. We see and aim to capture opportunities that can enable us to grow our business and create long-term value for shareholders." Looking ahead, to diversify its business, the Group will study the feasibility of engaging in e-commerce in Hong Kong. The Group plans to develop an e-commerce platform accessible via the Internet, mobile apps, multi-media terminals at its shops and other online to offline networks. Its hope is, that on the back of its extensive shop network and proven logistics system, it will be able to create synergies and generate revenue from B2C operations, and thereby drive the Group?s continuous growth. The Group has been working closely with various telecommunication-related services providers for many years, including with HKT Limited ("HKT"; stock code: 6823), and Mr. Alex Arena, Executive Director and Group Managing Director of HKT, who attended today's listing celebration dinner. Telecom Digital has partnered with HKT in operating SUN Mobile, and has benefited from the synergies generated from such ties, consequently making steady strides in the market. With the listing of Telecom Digital on the Main Board of the Hong Kong Stock Exchange, the Group is confident in accelerating its development in the new capital platform, and thereby elevate its business to new heights. Telecom Digital, one of the first paging operators in Hong Kong, was founded in 1974. In the past over four decades, the Group has been operating retail sales and distribution of mobile phones in Hong Kong and provision of paging and other telecommunications services in Hong Kong and Macau and it is also providing operation services to SUN Mobile. The Group has its own paging and Mobitex-based network system, a network of 69 shops and a logistics team comprising 28 staffers and 13 trucks in Hong Kong as at end of April 2017.